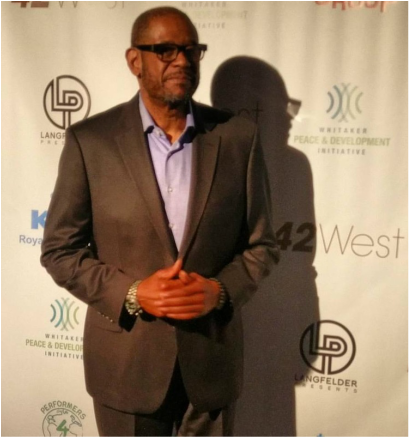 On Monday May 9th, Academy Award Winning Actor Forest Whitaker hosted a dazzling benefit at the gorgeous venue space, 42 West, in New York City showcasing a collection of Broadway performers who had all come together to support the "Whitaker Peace and Development Initiative". The "Performers4Peace" concert was held in support of Whitaker's charity organization which supports communities globally in war torn areas to develop stronger and more prosperous neighborhoods where all citizens can thrive. Hosted by James Monroe Iglehart who is famously known for his role as the Genie in the Broadway hit "Aladdin" the concert included a collection of songs sung by performers from "Dames at Sea", "Book of Mormon" and "A Chorus Line" just to name a few. The organization, which is relatively young, already has established operations in Mexico, Myanmar, Uganda, South Africa, South Sudan as well as in the United States. With partners across the world including UNESCO, UN Women, KLM Royal Dutch Airlines and the IKEA Foundation they have strong ties to several sectors of industry to help support and unite various countries in their efforts. Attended by supporters of the Broadway community and those who support the work of The Whitaker Peace and Development Initiative the message of global support for those less fortunate and the value of peace building across nations resonated throughout the night.